As a follow up to our book the other day, we thought it would be fun to make some nests of our own. 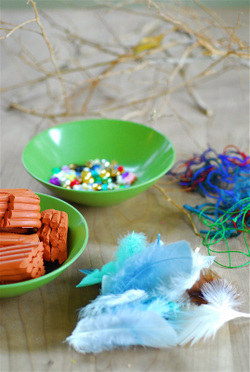 We gathered some materials: Sculpey clay, feathers, twigs, beads and a variety of string and thread. We also used some hay from our guinea pig. 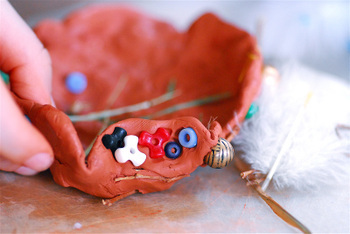 We shaped the Sculpey then added beads and string before putting it in the oven to bake. 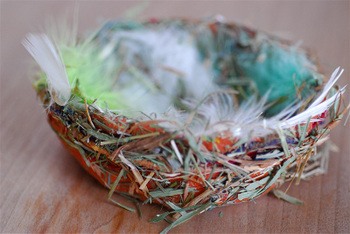 Afterwards, we let the nest cool then glued on feathers, hay, twigs, etc. Did you know February is National Bird Feeding Month? Click here to learn how to make your backyard a sanctuary for birds. Hi, have been reading your blog for a while and just wanted to let you know how much i enjoy reading it. 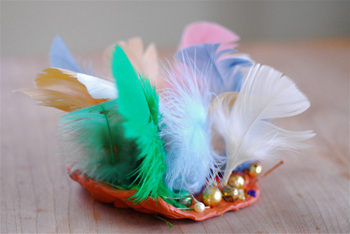 Those nests are so beautiful - a great idea. What a neat idea!! I am definitely going to try that! Wow, those are incredible! What an inspired idea! My mom (who lives in S. Idaho) has goldfinches at her feeders already! We can't decide if they're early or late...or just deeply confused. Time to get the feeders ready!